Does anyone else think it's weird that Black Panther didn't even hint at the Soul Stone? It's the last movie before Infinity War, it's the last stone left to reveal, the Infinity War trailers show Thanos' forces invading Wakanda, half the BP plot revolved around communing with the souls of the dead... so it's not too much of a stretch to assume the heart-shaped herb grows out of Soul Gem-infused soil, is it? Plus, it fits the pattern: Tesseract, Herb, Aether, Necklace, Orb, Spear. So why delay the reveal? I get that they already had to teach audiences about vibranium and its history, but would saying "the stone was inside the meteor" have been so confusing/time-consuming? T'Challa got a new costume in Black Panther, though it's not a major change from his Civil War duds: black suit, silver accents. Yes, the entire texture of the suit has changed, trading the layered panels for a more vertical and simplified design, but the point of an all-black costume is that those kinds of details just blend together; if they'd wanted us to notice the change, they'd have gone with Jack Kirby's "Coal Tiger" design (which, come to think of it, would have been a cool Easter egg in the movie - not a direct copy of the suit, obviously, but imagine if the suit he wore to the casino had been a black jacket with a red lining, worn over a yellow shirt with thin black stipes). While Killmonger's war suit was accented with gold, T'Challa keeps the silver. The layout is generally the same - face, necklace, gloves, belt, feet - but none of the specifics match. As an example, he still has lines over his cheeks and eyebrows, but none on his forehead, and adds one over the nose. The silver on his limbs is done as a series of seperate spikes, rather than straight lines, matching his necklace. 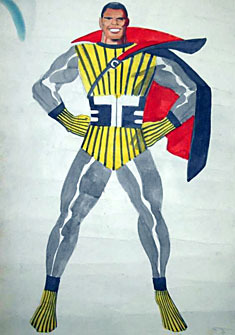 The figure includes an alternate, unmasked head, just like the previous one did. This one uses the new face-painting method, so the likeness is better - or at least, it would be, if they hadn't chosen a weirdly pale skintone for him. Brother's name might be "Chadwick," but that doesn't mean he needs to look like a "Chad," does it? The articulation takes a step up from Civil War, as well: we get all the typical ML joints, plus the addition of pectoral hinges. 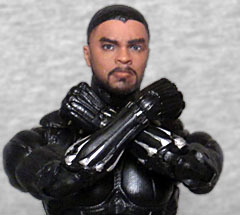 So if you swap out the "clawing" hands for the included fists, you can totally get him into a pretty decent "Wakanda Forever" salute pose. 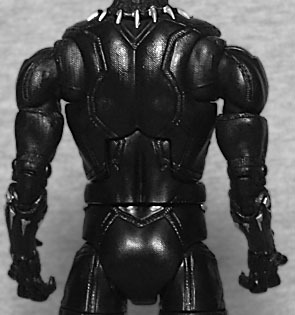 Beyond the superfluous bodyparts, Black Panther has no accessories. He does come with the head of the series' BAF, Okoye, but that just makes it look like the toy has two alternate heads. Especially since she's got a better skintone than he does. 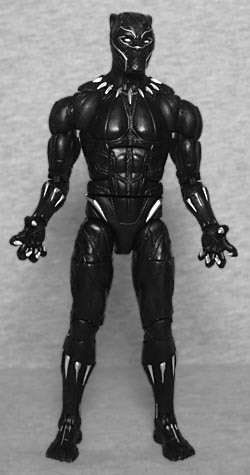 It's much easier to find this Black Panther toy than the last one, and it's got a better design, too. Too bad they couldn't get the face right.